The Genesis.XGi is the gravity fed version of the two latest airbrushes that showcase highlight Grex's continuing airbrush innovation. With this airbrush, they focused on ergonomics and adaptability. The design element is the ergonomic hand grip set that provides improved comfort and handling. It is specifically engineered for maximum adaptability by using the already wide selection of accessories available from Grex. The first thing you will notice on opening the box are the bright (Grex) green, ergonomic finger grip and 'trigger' button cover. Once you pick up the airbrush, and believe me you will want to pick it up, it just falls naturally into your hand. 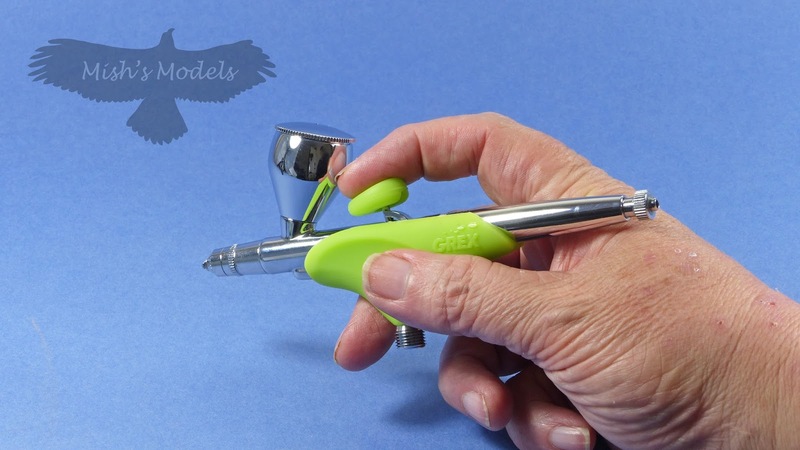 First impressions are; apart from the sheer quality that all Grex airbrushes exude, is of chunky and easy to hold airbrush. The shape of the ergonomic grip lends itself perfectly to the shape of your hand and it is immediately obvious the intended way to hold the airbrush. In the above photo, you will see that I have quite large hands and long fingers, with the 7ml paint cup fitted my 'trigger' finger is quite cramped by the paint cup, so I have opted you use the XGi with the 'trigger' button ergonomic 'pad' removed. However, this is a personal choice and only made necessary by my larger hands and long fingers. With both the smaller 2ml and larger 15ml cups I don't have any problem. So from the above you will have realised that the ergonomic parts are removable. Both for cleaning and should you decide to use the airbrush without them. 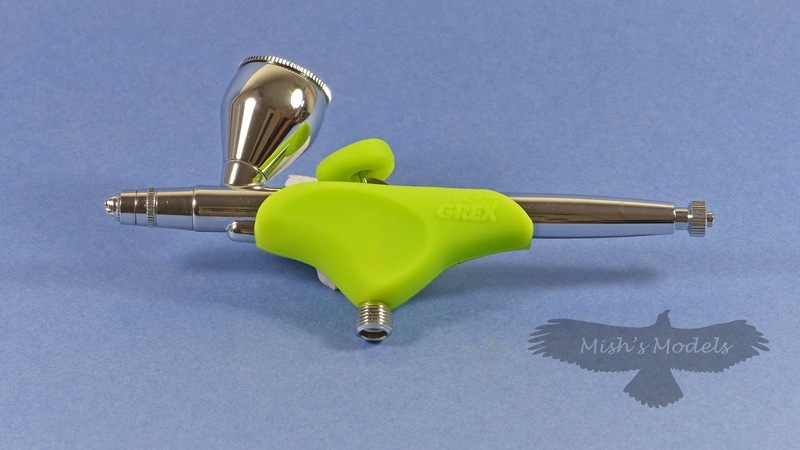 I ordered my airbrush with a 0.2mm nozzle and needle, however, Grex also supplies 0.3mm, 0.5mm and 0.7mm nozzle and needle sets. The needle and nozzle can be removed for cleaning or to change to a different size. This is done in the conventional way, by first removing the rear 'barrel', loosening the needle collet and then withdrawing the needle. Next you remove the nozzle cover and use the supplied spanner to loosen the nozzle, before unscrewing the nozzle and storing it so you don't loose it. The installation of a replacement needle and nozzle set is the reverse of the above. I found the XGi very easy to use, and straight out of the box I was spraying very fine lines and patterns. 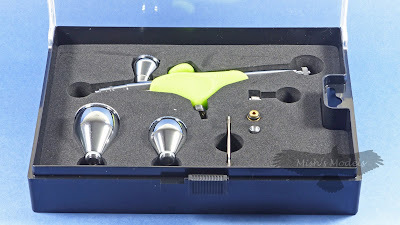 the control of both air and paint on this double action airbrush is very precise and controllable. Although I have not tried it in anger, I think I could even spray WWII Italian Airforce 'smoke ring' camouflage. Probably at 1:72 as well. The airbrush was comfortable to hold and after just a few minutes use I didn't notice the ergonomic grip. As the XGi is a 'conventionally' designed airbrush, I was able to get very close to the model especially with the supplied crown nozzle cap fitted. I already own a Grex Tritium.TG (review) and with the addition of the Genesis XGi I now have the flexibility of having the TG set up with a 0.3mm needle and nozzle for the spraying of larger parts and areas and the XGi set up with the 0.2mm needle and nozzle for smaller parts and finer detail. I have both set up with Grex quick release connectors so swapping between airbrushes in mid job couldn't be easier. I am indebted to Sean Middleton of Top Notch Models the official UK agent for Grex airbrushes for his help and advice in the selection of this airbrush. 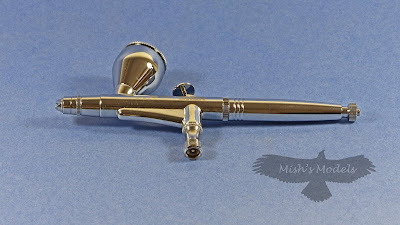 The Tritium and Genesis range of airbrushes are available in the UK from Top Notch Models. Sean is happy to discuss your needs, contact details.